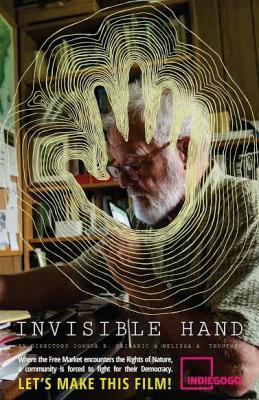 The team at investigative news nonprofit Public Herald is announcing their next feature documentary will be INVISIBLE HAND, a story about the struggle for balance where human rights, the free market, and the emerging "Rights of Nature" collide. An Indiegogo campaign to crowdfund the film was launched Dec. 1st, reaching 30 percent of a $30,000 goal in just 12 hours. The film trailer can be viewed on Public Herald's YouTube page. Joshua B. Pribanic and Melissa A. Troutman are the writers and co-directors of INVISIBLE HAND. They're also co-founders of Public Herald and produced their first documentary Triple Divide in 2013, which was co-narrated by award-winning actor Mark Ruffalo and featured investigations of unconventional oil and gas development, a.k.a. fracking. Public Herald won an INNovation Award in 2014 (Round 1) for Triple Divide to tour the film nationwide, increasing membership and audience engagement. INVISIBLE HAND is set to feature stories from a 15-part investigative series by Public Herald. The debut report, published March 2014, quickly caught national attention and prompted The Daily Show with Jon Stewart to produce their first segment on fracking. Since then, eight more stories have been published at PublicHerald.org featuring communities fighting for their rights against overwhelming odds. Award-winning democracy scholar Art Pearl will have his first documentary appearance in INVISIBLE HAND and speak in detail about his acclaimed "seven principles of democracy." He opens the film with, "The thing you have to understand is that democracy is impossible. But that's not a problem." The filmmakers will be using exclusive footage from Grant Township, Pennsylvania, where local Rights of Nature legislation was passed in 2014. The Rights of Nature will be a focal point of INVISIBLE HAND as communities worldwide are enacting new laws giving rights to nature in order to fight unfettered corporate rule in a democracy. "If everyone who reads Public Herald visits the Indiegogo campaign and contributes, then we can meet our ambitious goal to make this documentary together – a film that will be 'by and for' the public interest," say the directors. "Original, gripping, and explosive, INVISIBLE HAND will challenge our views of economy, human rights, nature, and democracy." Learn more about INVISIBLE HAND and read new investigative reports at PublicHerald.org.